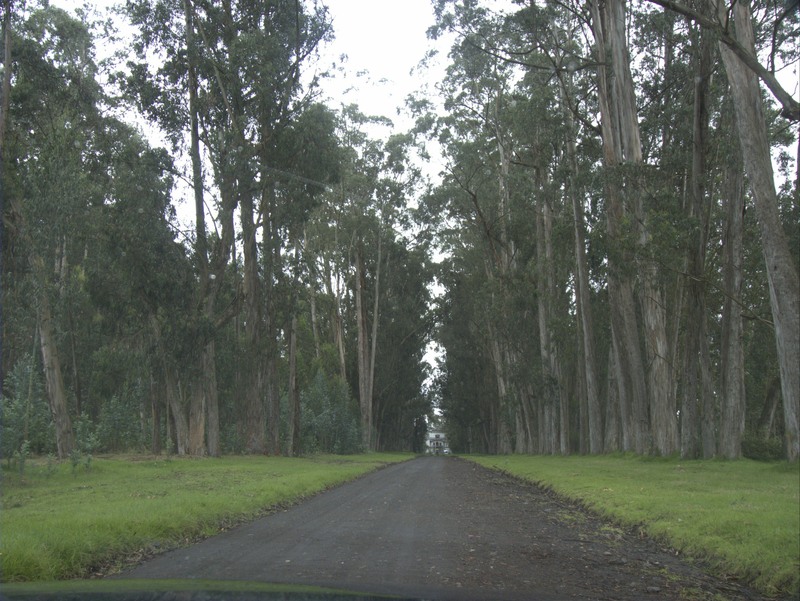 It is late afternoon as we drive up the long, eucalyptus tree lined avenue, glistening a dark, wet green in the swirling mists. 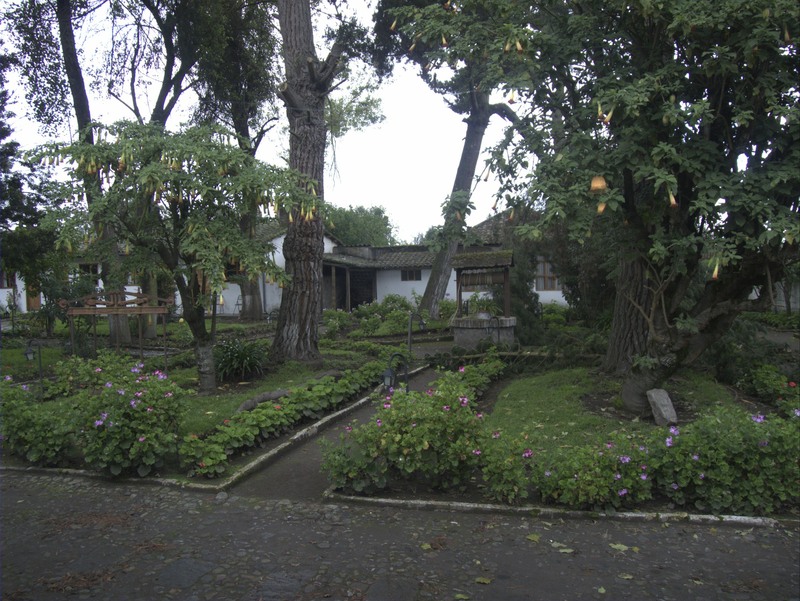 At the end of the long drive way, a glimpse of a white facade invites us onto the inner grounds of the 16th century hacienda, La Cienega. As the driveway progresses, time falls away, and we feel as if we are transported into a southern plantation a la “Gone with the Wind”. 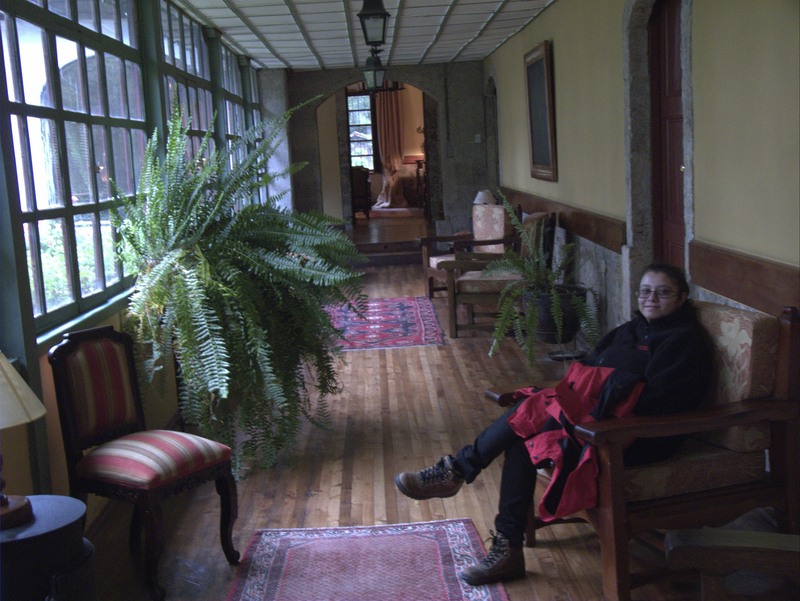 After a long day hiking in the Cotopaxi National Park, we are looking forward to some R&R. While planning the trip, when we heard about the possibility of being able to stay in a heritage property that was conveniently located, we jumped at the chance. 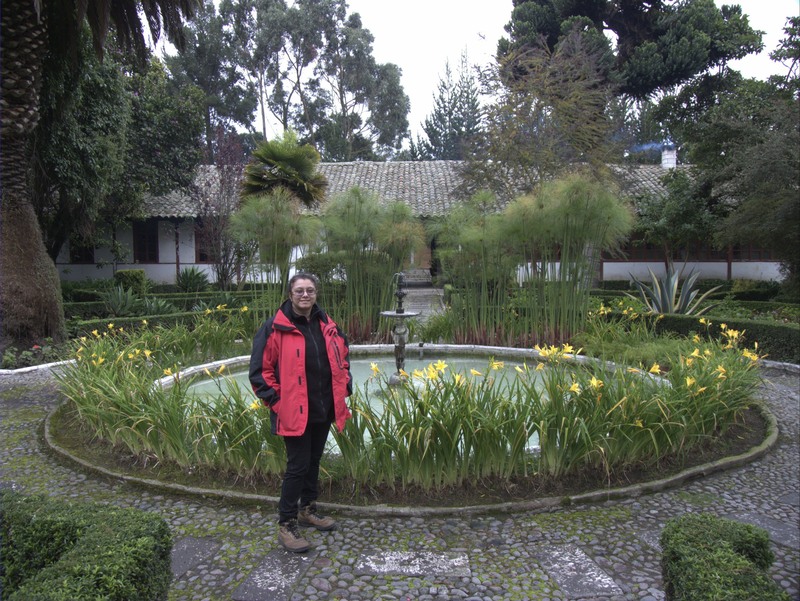 Tucked away in a small area near Lasso, Hacienda La Cienega provides a unique getaway for visitors to this stunning part of Ecuador. We drive around the pretty ornamental fountain and pull up in front of the entrance. There are a few vehicles parked out front, luckily none of the large tour buses that are known to stop over for lunch. Our guide Rafael pulls into a vacant spot and we get out into the cold, bracing air that is typical of the Ecuadorean highlands. The mists are redolent with the distinctive smell of lush greenery, tempered in this case by the thick, herby scent of the ancient eucalyptus we have driven through. Looming before us, the grand facade of the hacienda dominating the lush courtyard is white, but its resemblance with Tara ends there. What we see is colonial, yes, but proudly manifesting its South American roots. The hacienda has that comfortable lived in look, not polished white to a T, but mottled and variegated, with its age showing gracefully, Its entrance portico is lined with pillars and topped with a semicircular balcony , looking out over the courtyard. I love how old spaces like this are like a veritable time machine. One could almost imagine the hacendado, or the owner of the hacienda, coming out on to the balcony to survey his property. The entrance lobby, with its old, wooden floors, polished to an ageless patina, and its long wrought iron staircase riding upwards, opens out at the back to a beautiful inner courtyard and garden. Speedily, checked in, bags whisked away, we are ready to go explore our surroundings. We walk out into the garden. The sky is overcast, as it has been all morning. The well tended to shrubbery is laid out in a circular shape, around a pond lined with local plants and flowers. It makes for a very pretty picture. It’s getting colder by the minute. The plants seem to like it though. The greens are turning darker and the colors of the flowers become sharper in the imminent twilight. An old set of wooden doors beckon. We enter through them and encounter the private chapel. 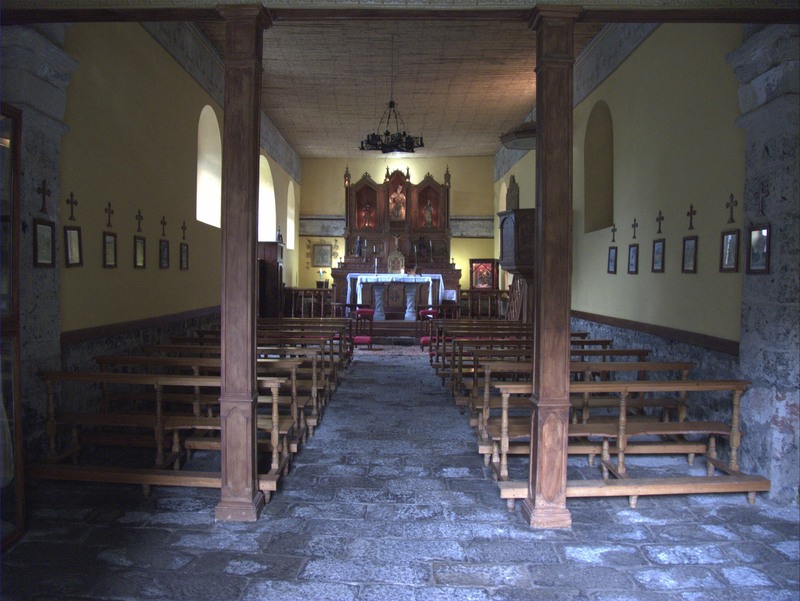 The carved benches, and collection of bells are so very old, from the 15th century. It would be easy to feel closer to God in this place, I think. For the Spanish colonisers of South America, land was literally thrown into their lap for services rendered to the Spanish crown by way of grants called encomienda. In Ecuador, the best tracts of land were in these highlands, where the temperature and soil provided for a comfortable living from agriculture. Most of them used local labor – the Runa, a Quechua speaking indigenous population worked on these lands as virtual slaves. In an effort to integrate them into the Spanish empire, the Runa were taught Spanish, and the tenets of Christianity. Over a period of time, the Spanish crown withdrew their patronage, and these properties became privately held estates called haciendas. Agriculture and cattle herding continued to be the mainstays at the haciendas, and the tradition of the “Chagras”, or the Ecuadorean cowboy, started here. 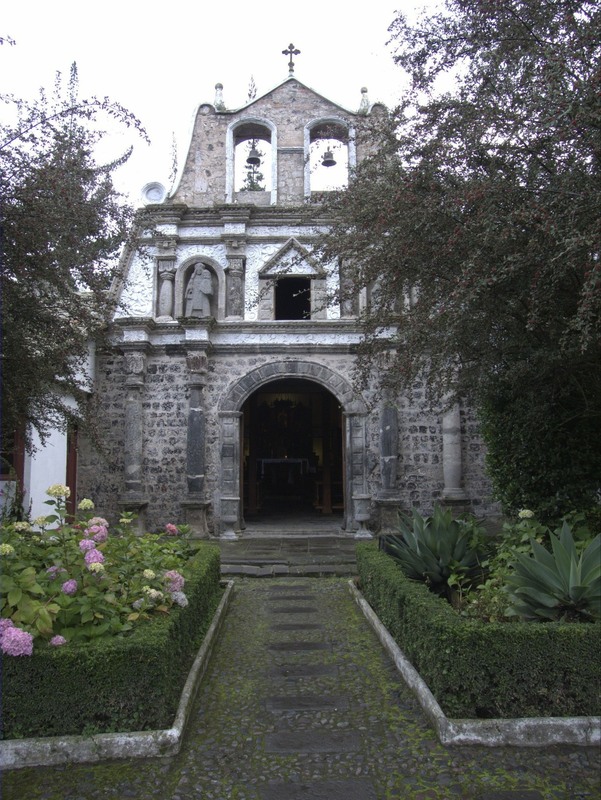 La Cienega was bought by a landowner named Don Matheo de la Escalera y Velasco in 1695, and is currently owned by the descendants of the Maenza family. 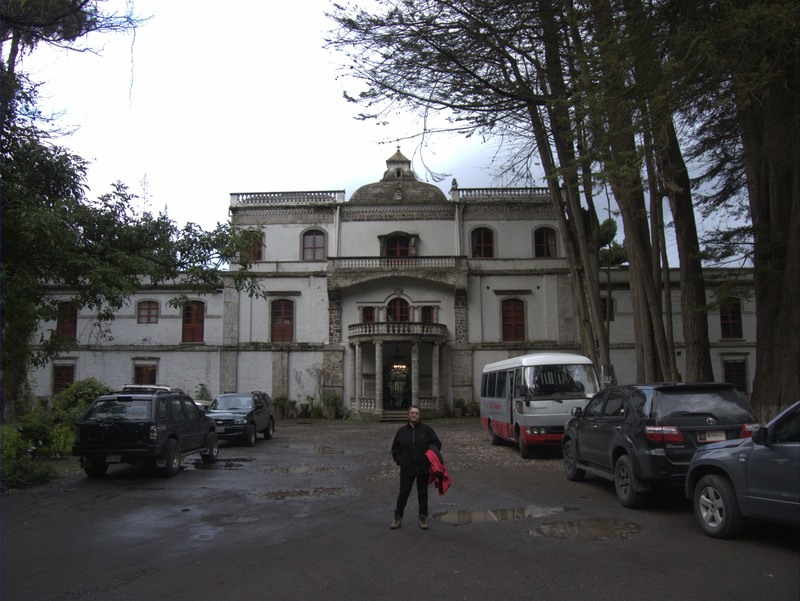 In 1742, the Cotopaxi volcano erupted, causing widespread destruction in the area, but the hacienda was spared due to its thick outer walls. Today, the same walls impede a good wifi transmission, but safety trumps connectivity, I should think ! We walk around the back of the property passing the tennis court, from where, on a clear day, you could have a fantastic view to the Cotopaxi volcano, while playing for the set. Then round the swimming pool, who could possibly want to swim in this weather ? The silence is punctuated by the whinnying of horses, used earlier to manage the estate, and now for indulging the visiting guests. We debate it, and then decide that what we want most of all is to return to some semblance of warmth. On the way back, we come across the gift shop, with its selection of alpaca ponchos and traditional Ecuadorean craft. The little shed it is in provides a brief respite from the elements, before we finally emerge to the rapidly approaching darkness. 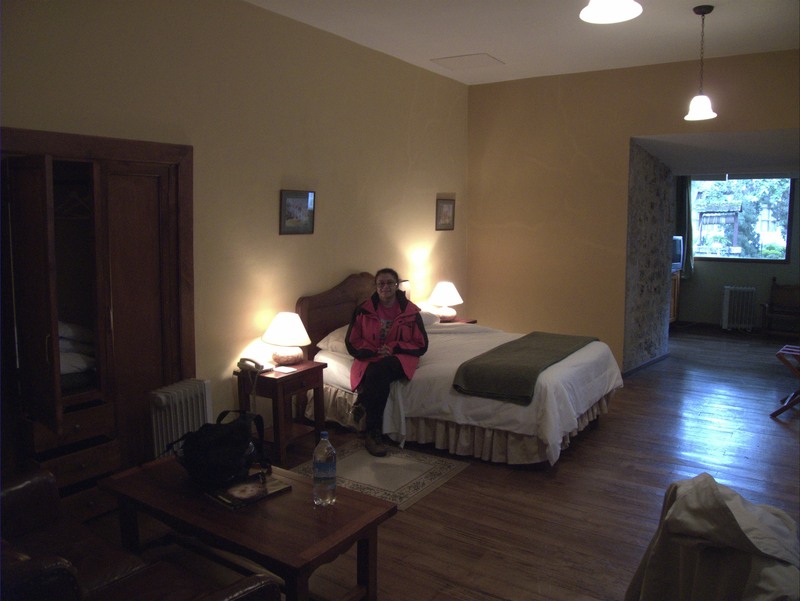 Our room is a suite, tucked away in a corner of the main house. Like the rest of the property, it is showing its age, but that’s not all bad. I wish that it wouldn’t be so dark though. For some reason, South American hotels tend to have their rooms very dark, and even the bedside lamps, when switched on, give out a feeble glow. It is all but impossible to rouse ourselves from the warmth wafting from the wooden fireplace, which has been lit in our absence. But we have to get dressed and join Rafael for dinner. We walk through the garden, the lights around the property emitting a soft, incandescent glow. 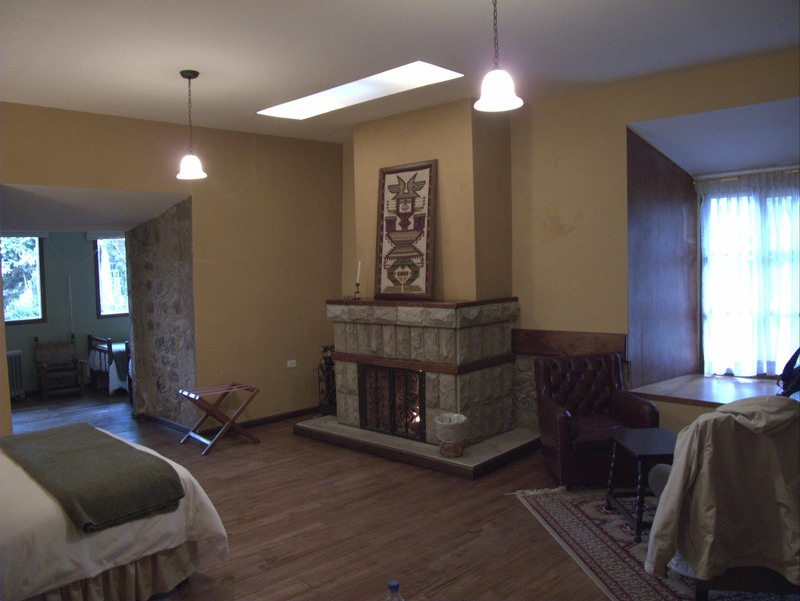 The restaurant at the hacienda, presided over by a most welcome huge fireplace, provides local Ecuadorean specialities. Luckily for me, there are a couple of vegetarian options – a vegetable stew and a mushroom crepe. Both Gordon and Rafael opt for the lomo saltado, and profess their satisfaction with their choice. It’s not a fantastic meal, but it’s good enough. We are serenaded by a local band playing Andean pan pipes. This is the first time I am listening to this on this trip, and so it comes at me with novelty, but in a few days, I will tire of the repetitive repertoire. Tonight however, the strains of music truly make me realise that I am here, in South America. All that remains is to go back to our warm rooms, where the beds have been turned down. We slip between the sheets to discover hot water bottles to warm our feet. There truly is no better bliss than warmth slowly edging up your tired body when its freezing cold outside. 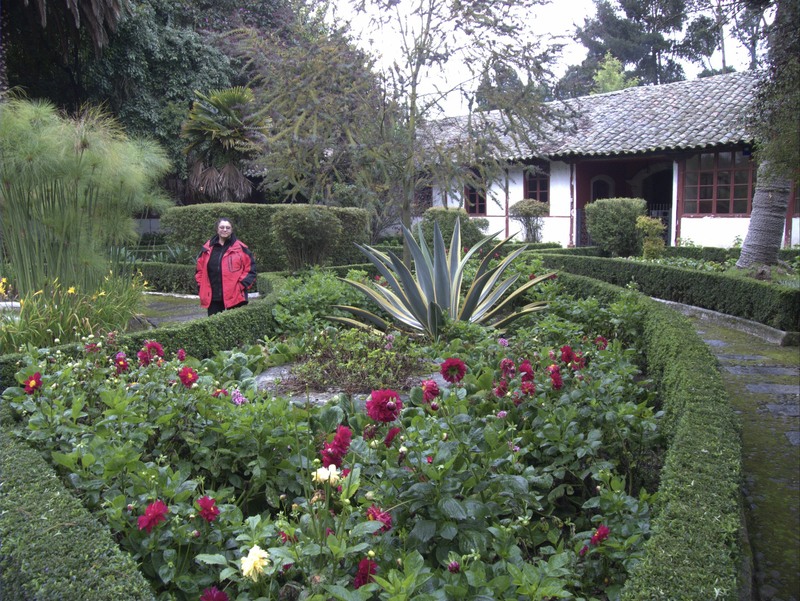 Over the years, the hacienda has played host to a number of important Ecuadorean and international guests, and has been witness to several key events in Ecuadorean history. Yes, it can use a makeover, the rooms can be spruced up a bit. Some modern touches can turn this place into a top notch luxury getaway. But I wouldn’t want anything that would detract from its stately character. Working museums like this heritage structure are meant to be old, and have flaws, which shouldn’t be papered over. Give me a bit rustic, a little run down, over devoid of character and sterile any day. Do : Request a room with a fireplace in the main house, as not all rooms have them, and room heaters are not effective enough against the cold. Also request a portable heater as the fire can fizzle out during the night, especially if the wood is damp. Don’t : Expect a luxury five star hotel. Dinner ends at 8.30 pm and there’s not much to do afterwards. 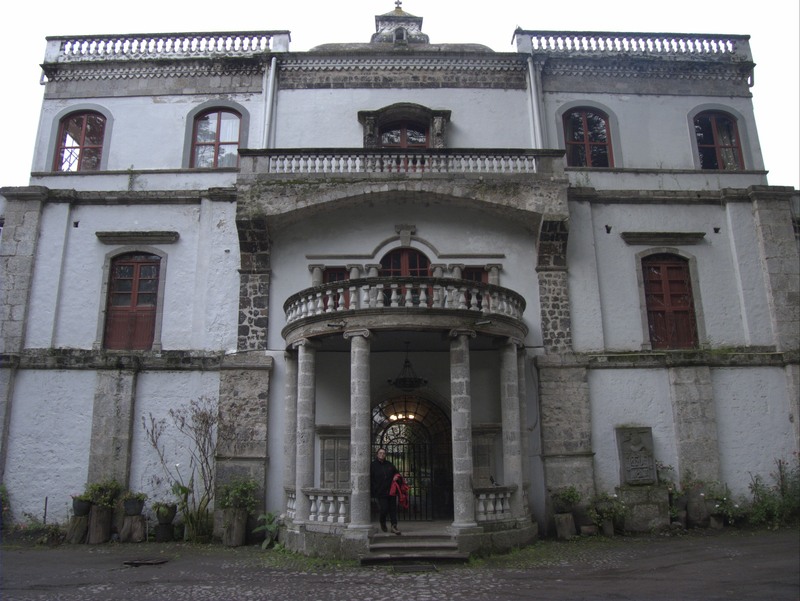 This is a heritage property, and part of its charm lies in the fact that it retains aspects of that colonial heritage.